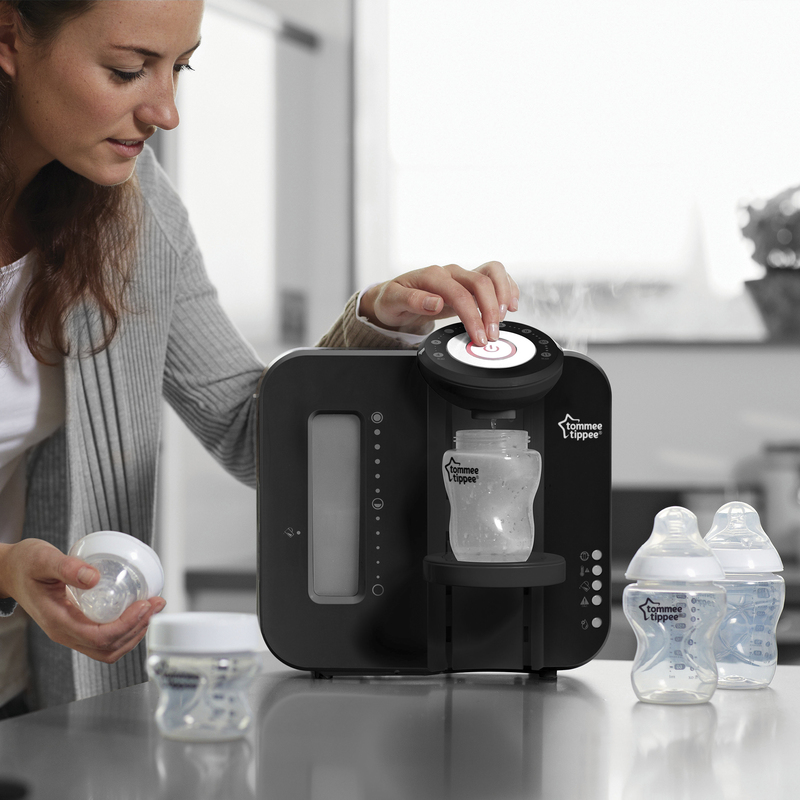 To help make preparing bottles quicker and more accurate, the Tommee Tippee Perfect Prep machine gives you the extra peace of mind that comes from knowing your baby’s bottle will be perfect every time. Tommee Tippee agrees that breast is best. However, we also recognise there are times when this isn’t possible. The Perfect Prep machine works with any formula milk to provide parents with a quick and easy way to create a safe feed at the perfect temperature in under two minutes. HOW DOES THE TOMMEE TIPPEE PERFECT PREP MACHINE WORK? The Perfect Prep machine automatically controls the quality, volume and temperature of water in producing formula feed. Once the water is in the hopper, it passes through a unique filter to remove bacteria and impurities. The machine is then ready to make up the feed. It begins with a ‘hot shot’ of over 70° to kill bacteria which may be in the formula powder and finishes by dispensing the correct amount of water for the required volume of feed at body temperature. WHAT TESTING HAS BEEN DONE ON THE PERFECT PREP MACHINE? Baby safety is at the heart of Tommee Tippee and the Perfect Prep has undergone rigorous testing to demonstrate this point. This includes proving the effectiveness of the filter and hot shot, that the dosage control of water is accurate and that the feed is always the correct temperature for your baby. DOES PERFECT PREP ADHERE TO NHS/WHO GUIDELINES? Perfect Prep is designed to achieve the same result as following the NHS/World Health Organisation (WHO) guidelines. These were designed for making up a feed without a Perfect Prep machine and state that boiled water, which has cooled for no more than 30-minutes, should be used. Perfect Prep is designed to produce the same safe formula feed but in a much quicker and more convenient way. This saves both time for parents and frustration for the baby without compromising on safety. For further information on the Perfect Prep, visit the Tommee Tippee website. Previous article A sleep solution for those chilly nights.